Arnish Moor Wind Cluster is currently the only operational commercial windfarm on Lewis. Originally the European subsidiary of Texas utilities giant TXU were involved in the windfarm but went bankrupt in 2002: Farm Energy Ltd then became the sole interest in taking the project forward. The project has since changed hands, to a Jonathon Johns (circa 2004) and Johnathon Moulton (circa 2006) and the current owners are publicly represented by FIM Services Ltd. It is believed that Wind Prospect Ltd are responsible for the day to day running of the installation, although it does not appear on their website and that the turbine operation is controlled from Germany. 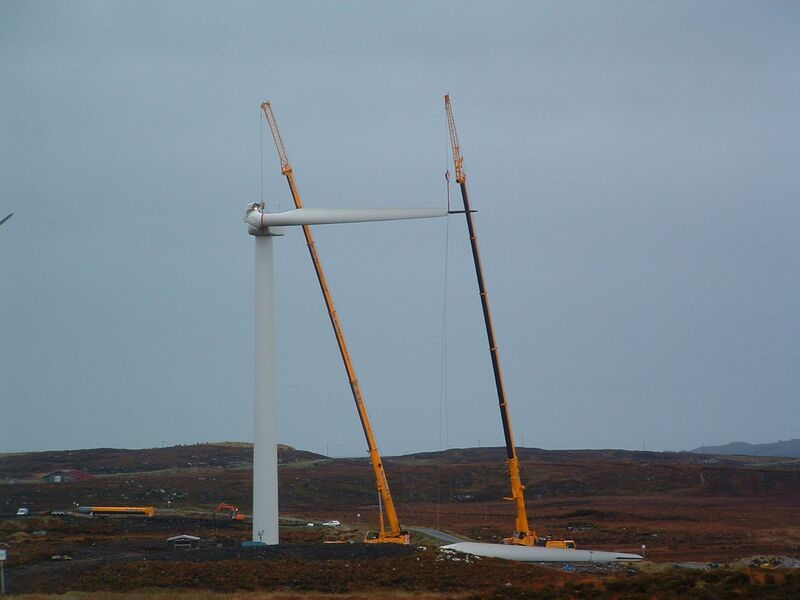 Although given planning permission by Comhairle nan Eilean Siar in 2001, construction only commenced in autumn 2006 with the turbines being assembled in November 2006. While local firms prepared the foundation area, outside contractors were responsible for the majority of the errection work. Completion of the windfarm was delayed when a section of turbine tower, being imported by boat, from Denmark, fell overboard. Since that time the turbines have worked intermittently, and commonly only two out of the three turbines are seen turning. In June 2007, following much public comment on the performance of the Arnish Moor turbines the following explanation appeared in the local newspaper, the Stornoway Gazette. The project does not lie in a designated area but it is known that Annex I/Schedule I species including Divers and Golden Eagles are present on Arnish Moor. The Loch Orosay SSSI is located immediately to the south-west. According to the Environmental Statement, the bird survey took two days. Breeding bird interest reported includes teal, mallard, red-breasted merganser, red grouse, oyster catcher, golden plover, lapwing, dunlin, snipe, curlew, redshank, common sand piper, lesser black-backed gull, herring gull, cuckoo, skylark, meadow pipit, wren, wheatear and starling. Other birds reported in the vicinity included grey heron, buzzard, great skua, hooded crow, raven, black-throated diver and greylag goose. The ES reported that all survey data on protected species are contained in a Confidential Addendum. This remains hidden from public scrutiny.